The PENN Pursuit II features a durable construction and the smooth gear system anglers expect from PENN. 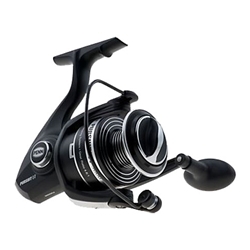 This reel features an ultra lightweight, corrosion-resistant graphite body and dependable oiled-felt drag system making the Pursuit II the best value for the money for saltwater anglers. The Instant Anti-Reverse eliminates even the slightest rotor back play for instant hook-ups every time, while the 4 shielded stainless steel ball bearings provide smooth retrieves.